We work with a wide range of commercial and public sector clients providing highest quality tiling installations for kitchens, bathrooms and front of house. Installing and fitting the highest quality tiling across London and Kent, including Chelsea, Cobham and Maidstone, we work with a range of commercial and public sector organisations ranging from retail stores to city offices and even national embassy buildings. Working to the highest standards we provide a highly personalised and bespoke range of services and products that ensure superbly finished tiling in commercial kitchens, bathrooms or front of house areas. We only use highest quality tiling from leading manufacturers and suppliers in all our work. With a diverse range of ceramic, glass and natural stone tiles including limestone and marble available we can help you make the right choices aesthetically and practically or simply supply to the requirements of your architect or interior designer. 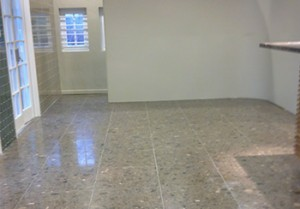 To achieve the finest finish quality we ensure professional and comprehensive preparation of all tiled surfaces. Stripping down previous tiling and décor we ensure a level and solid base for the tiles through services including screeding, latexing, skimming and plastering. Full references are available by request from a range of our previous commercial and public sector clients. We take health and safety extremely seriously and operate a full health and safety policy to ensure a safe working environment for our installers and your own team. Fully covered by liability insurance we take pride in an excellent safety record and an installation team well aware of their health and safety responsibilities throughout installation, and through their finished workmanship. Based in Chatham, Kent, we work throughout Kent and London, providing commercial clients with the very best tiling services. We have recently completed projects for commercial customers in Wimbledon, Clapham, Dover, Chelsea, Cobham, Maidstone, Medway, Sevenoaks, Canterbury, Orpington, Balham and Bromley. Contact us today and we can arrange a no obligation survey and quotation with one of our experienced commercial tiling team. Our highly skilled team will visit your property at your convenience and carry out an expert installation that will meet your requirements perfectly. Tiling is a superb solution for practicality and aesthetics in rooms like kitchens and bathrooms where damp and spillages are commonplace. Working to the highest standards we provide a highly personalised and bespoke range of services and products that ensure superbly finished tiling. We specialise in electrical under-floor systems which are quick to install, require no plumbing and cause almost no change in floor height.